Blooming flowers means time for some blimming fun! Springtime is the ultimate best of both worlds in Chamonix, as a mix of late winter and early summer activities beckon. Cycle your way to a glacier hike, fly to your rafting session or take a helicopter to your horse-ride. Here is our list of Chamonix spring activity suggestions. The Chamonix valley is a mecca for experienced paragliders or those looking for a new – higher – perspective on the valley! You can take a flight all spring from the mid-station of the Aiguille du Midi for 120€ (plus your one-way ticket price), or even from the top at 3,842m for 240€. Take in fresh spring air and mountain vistas from high above Chamonix with your qualified pilot. Read our review of paragliding in Chamonix for a preview of what is in store for you. Fly over the Mont Blanc massif and marvel at the unforgettable glacial scenery of the Alps this spring. Helicopter sightseeing is becoming increasingly popular in every season and is undeniably the best way to see Chamonix Mont Blanc. You can boast to all your friends that you’ve been to the summit of Mont Blanc without any hike at all! 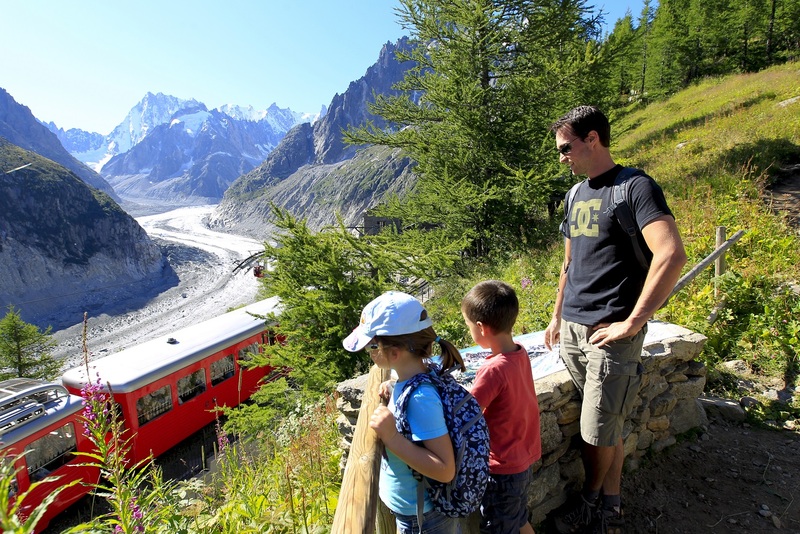 Enjoy stunning scenery from your historic train seat (109 years old in 2018), a gentle journey for all ages to the Mer de Glace glacier – the largest glacier in France. From the top, the incredible Aiguilles des Drus and Les Grandes Jorasses feel closer than ever (unless of course you plan to climb them!). From the Montenvers train station prepare your knees for over 400 stairs to the incredible ice grotto. If you have booked your guide and equipment you will also be able to set off on the glacier itself by foot! If you would rather scale the Mont Blanc for real than hire a helicopter this spring, you’re in luck (almost!). Spring is often the best season for hikes around Chamonix. The local terrain options are as diverse as they are spectacular from day hikes to expeditions. In spring some paths may still be in the process of revealing themselves under melting snow, check with the local experts which hikes are suitable to take on. You may also need some special equipment for dealing with snow patches which haven’t disappeared yet. At the height of the summer, there are over 350km of well-marked hiking routes, so there will be plenty to choose from even early in the season. From relaxing river-side wanderings to steep endurance hikes for all levels we can help you find the right mountain guide or itinerary for you in Chamonix Mont Blanc. The selection of climbing routes in Chamonix is vast in both style and ability level. There are 19 bolted outdoor routes to take on, as well as the Aiguilles Rouges and the Mont Blanc Massif itself towering over the town. A mountain guide is essential and can be booked with advice from Chamonix All Year. As a more “entry-level” activity why not try via ferrata, a series of ladders and bridges bolted to, and between, towering mountain faces? Mont Blanc Escalade is open daily with wall climbs to suit every level of climber, even the kids. There is a famous children’s wall choc with easy routes for tiny beginners. A professional instructor is required if your child is not accompanied by an experienced adult. One can be hired on-site, as can your gear required to climb safely (shoes and harness). For opening hours/prices visit their website: http://www.montblancescalade.com/. The Mont Blanc region has superior rafting territory right on our doorstep: the Giffre, the Arve and nearby the heralded Dora Baltea. 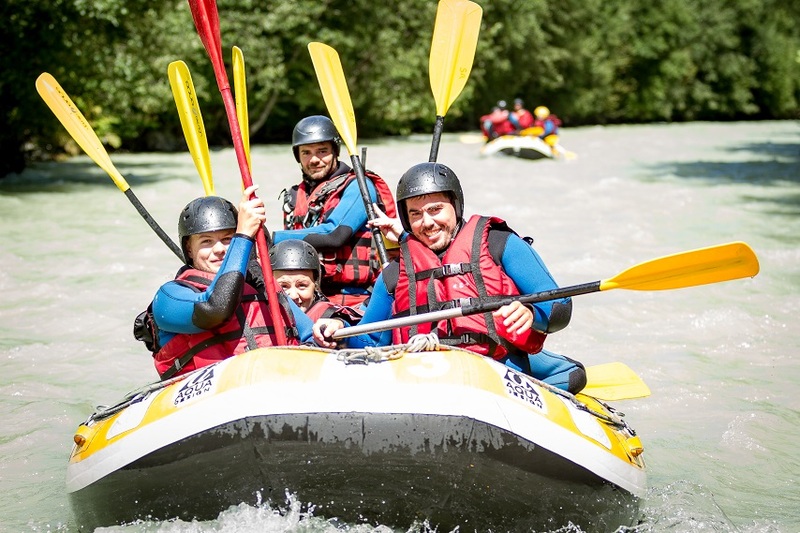 Rafting is a brilliant family day out and is a total change from the experiences at altitude around us. After the winter comes the big thaw, bringing rising water levels. From May when the rivers are running high enough, the awesome rapids of Chamonix are yours to ride and the watersports season begins! Other water sports on offer later in the season include canyoning and hydrospeeding. Chamonix can be a healing place with a plethora of wellness activities to discover. Yoga and pilates sessions can be booked in the privacy of our scenic surrounds, or you can join a local class. This is a great way to spend your time soaking the peaceful energy the mountains provide. From relaxing rides beside breathtaking views to adrenaline-pumping downhill descents, the Chamonix valley has an abundance of biking trails and road cycling routes for all levels. As the winter snow recedes the perfect entry-level ride to enjoy the forests surrounding Chamonix will take you from the town centre to the Paradis des Praz (more info below). See here the Chamonix > Les Tines route in the official map guide. As the days are longer with more sunshine, passionate road cyclists will also be lining up to take on the Tour de Vallée du Trient (also seen in the official guide). Tour de France fans will recognise the Col de Forclaz from the 2016 Tour de France, famous for the incredible views at the spectacular stage finish: Emosson Dam at 2205m. Equipment can be hired through Chamonix All Year. Here are our recommendations for the best bike shops in Chamonix. As well as the best English guide to local biking available to purchase online: The Chamonix Bike Book. This best outdoor play area for children in Chamonix lies in fairytale woodland along a wide slow – and glacially cold! – stream. In the shade with water features, it is the perfect getaway for children to cool off from a day of adventure. 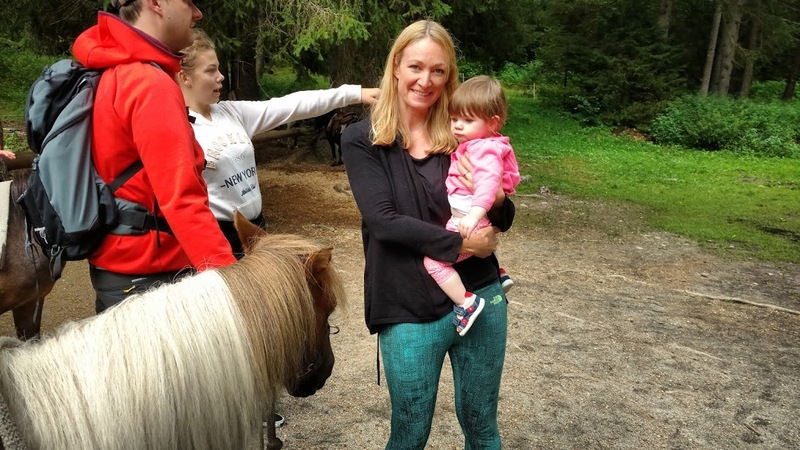 Paradis des Praz is located behind the golf course and is home to our favourite pony ride for small children (more info below). There is a cute cafe, plus plenty of space to run around the playful structures, well-maintained by the local community. Yes! You can discover Chamonix on horseback. Novices and confident riders alike can enjoy the spring terrain as flowers start to rise and the ground grows greener. The Centre équestre du Mont-Blanc (Mont Blanc Horse Riding Centre) runs annually where you can trek on horseback for half a day, full day or even several days. 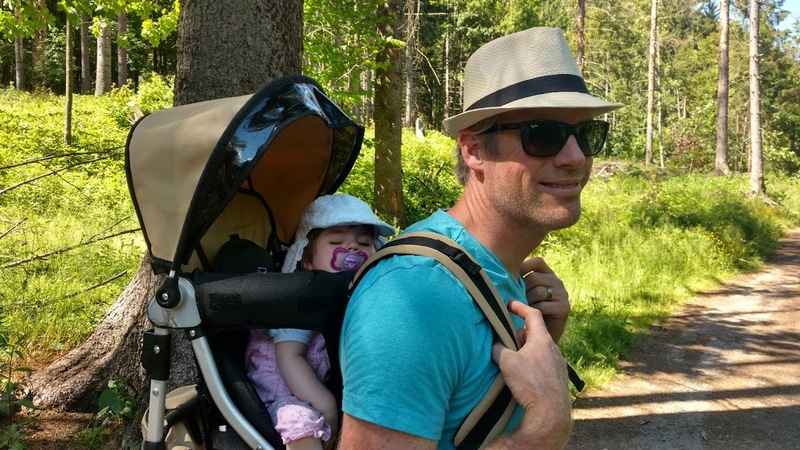 And for families to experience their first ride together, choose Paradis des Praz. Pony rides are available here in the idyllic forest setting. Holding a short lead, parents lead their kids on the ponies along a path for just 5€, or jump on a horse-drawn cart together for 5€ each. Open from 1st May, Parc de Merlet is a great place to go and spot wildlife in their natural habitat. 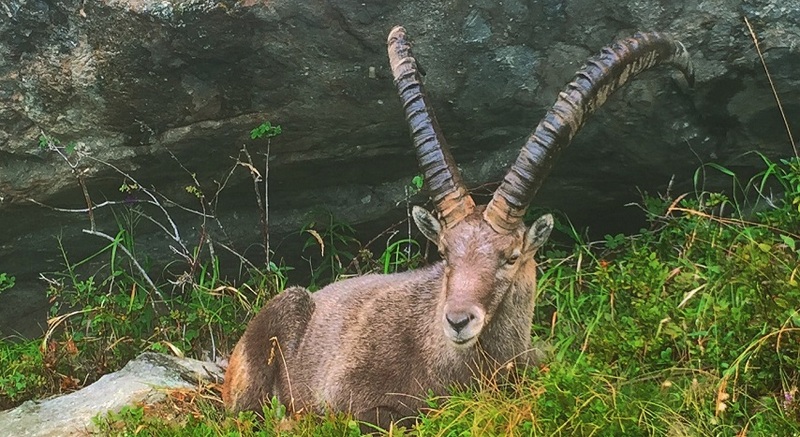 It is a large nature reserve set high above Les Houches with marmottes, deer, the majestic chamois and more. Local tip: You can hike to the Parc de Merlet from Lac des Gaillands in under 2 hours, look out for the tree sign revealing a daily discount code in appreciation of the low environmental impact of your hike. Visit their website. Compared to Parc de Merlet, the Parc de Loisirs is more of a mini theme-park and playground, with lots of fun rides including trampolines and even a railed luge run! Located opposite the Planards piste in the centre of Chamonix, this is an easily accessed and fun place for young and old to spend a few hours. There is also a restaurant with a sun-soaked terrace from which to take in the mountain vista above Chamonix central beyond. Outside of this long list, there is also the local culture and cuisine that continues to tempt travellers and grow in size and colour. Plant your seeds by booking spring in Chamonix and your harvest will be particularly colourful. Spring is the perfect season to see the best of both worlds in Chamonix, and Chamonix All Year can’t wait to show it off to you – like a big bouquet of fresh wildflowers! So if you’d like to try out one of our Chamonix Spring activity suggestions, get in touch now.